Roald Dahl’s only stage play flopped. The Honeys, a tale of two serial-killing sisters, lasted only 36 performances on Broadway in 1955. “He was not a man of the theatre,” says David Wood, who has adapted eight of Dahl’s novels for the stage. Almost 25 years after his death, though, Dahl has become big theatrical business. Matilda, the musical created by the Royal Shakespeare Company, has been seen by more than 2.5m people, with the Broadway transfer set to pass the $100m mark this month. Charlie and the Chocolate Factory, another musical, is up to £51m, having just sold its millionth ticket in the West End. Composer Marc Shaiman recently let slip that it’s also Broadway-bound in 2016. Dahl continues to dominate the listings at this magical time of the year, when Britain’s theatres look to replenish their coffers. 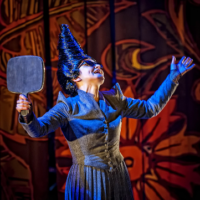 West Yorkshire Playhouse has its homegrown production of James and the Giant Peach. The BFG is playing in Birmingham, Exeter Northcott is serving up George’s Marvellous Medicine. In April, the Royal Court – that front-line of edgy new writing – will deliver The Twits, “mischievously adapted”, the blurb says, by Irish playwright Enda Walsh. Walsh is an inspired match for Dahl. His first plays included a fairytale about intellectual disability and The Ginger Ale Boy, about a kid with a flair for ventriloquism. Today, that dottiness remains, albeit much darker – darker even than Dahl. Walsh’s brittle, damaged protagonists often shut themselves away, retreating into deranged fantasies. The Twits doesn’t even have much of a plot. “It’s kind of like Beckett for children,” says Kenyon. Mr Twit pranks Mrs Twit, who retaliates – and so on until a disease, the Shrinks, bumps them both off. Vladimir and Estragon would take their hats off to that. Dahl did just that: his books began as bedtime stories, spun on the moment, only written down the next day. “There’s a kind of anarchy in the way Dahl writes,” Kelly explains. “That’s what’s exciting about his writing but, actually, when you’re structuring something for the stage, it can give you real problems.” Dahl meanders and ricochets. Drama needs a sense of direction. Solve such problems, though, and you’re set. Child protagonists have always worked well on stage, and the freewheeling nature of Dahl’s plotting makes for great set pieces: Bruce Bogtrotter’s cake challenge, for instance, or Bruno Jenkins’ mousey metamorphosis in The Witches. The language, with its snozzcumbers and frogscuttles, practically begs to be spoken aloud. That lick of fantasy and magic – what Kelly calls “an anarchy of the imagination” – leaves plenty to relish. Even so, the stage isn’t a purely fantastical space, and one reason Dahl suits it so well is that his fictitious world isn’t either. For all its Oompa Loompas and telekinetic schoolgirls, Dahl’s world is basically our own. Walsh says it’s like “seeing a traditional England being twisted and made dark.” Greig thought about Charlie Bucket, living “on the edge of the edge of the edge of town” on a diet of cabbage soup. “Kids like that exist,” he says, “but they’re in Rio or Lagos, in slums and favelas.” But, says Greig, “what Dahl brings is a Dahlian worldview” – and the key to that is a strong moral core. Theatre has a powerful sense of ethics and Dahl’s stories are driven by an urge for justice. He’s particularly brilliant at delivering “baddies” their comeuppance. And what baddies they are. Kelly says he “could have written the Trunchbull a miniseries” but Liccy Dahl, Roald’s widow, reined him in. “She said, ‘You must remember she’s a murderer.’ ” Greig adds: “Until the final moments, you’ve no idea if Willy Wonka’s good or bad.” Essentially, he’s a billionaire dispatching spoilt brats to find a successor. He’s a vigilante with a sweet tooth. That’s catnip to theatremakers such as Kelly, Greig and Walsh. Theatre is a slippery art-form, capable of admitting complexity and holding contradictions – so it suits Dahl beautifully. He might not have been a man of the theatre but he’d have fitted in well.